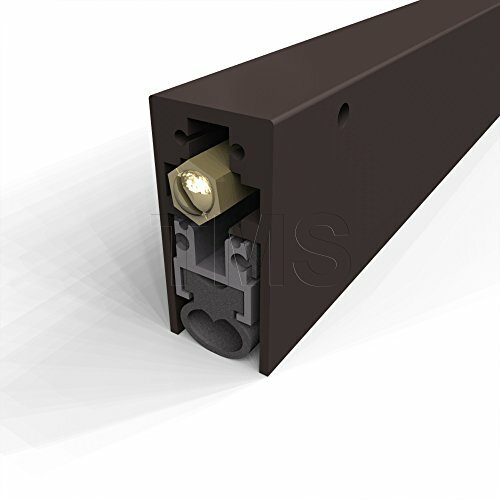 This automatic door bottom is designed to provide soundproofing protection by sealing the gap at the bottom of the door. It is also rated for smoke and fire protection, up to 3 hours. It utilizes a concealed flat spring mechanism which is activated upon opening and closing the door. This motion ensures a smooth usage even on an uneven surface. It is made of heavy duty material that is built to last. These door bottoms have been tested through 5 million cycles! The aluminum anodized casing is fitted with a solid neoprene seal that compresses, with a maximum drop of 1", when the door is closed. It is compatible with a saddle or directly onto the floor and it can be applied to right or left handed doors. If you have any questions about this product by Trademark Soundproofing, contact us by completing and submitting the form below. If you are looking for a specif part number, please include it with your message. CRL Aluminum Finish Heavy-Duty Door Sweep 48"